As President Obama unveils new efforts to help college graduates with student loan debt, there's new focus on the problems that drive that debt: the cost of college and the reasons it's been skyrocketing. Anya, why don't we take the example of a working-class student at a four-year public university getting no help from mom and dad? What do the numbers look like? ANYA KAMENETZ, BYLINE: Yeah, so we often hear, you know, in my day, I worked my way through college, why can't you? And if you look at the numbers in 1981-'82, the average cost to go to a four-year public institution, in dollars back then, was $2,800 - tuition fees, room and board. And the maximum Pell Grant award - that's free money from the government - was about $1,800. So that leaves a student with about $1,000 to cover out-of-pocket. And, you know, the minimum wage back then was about $3.35 an hour, so you could pretty easily cover your expenses and have extra money to spend if you work full-time in the summer or just six hours a week all year round. BLOCK: So that was back in '81-'82. KAMENETZ: Well, so today the four-year public university is going to cost about $18,000 for an in-state student. 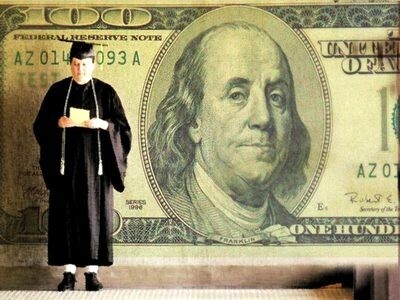 The maximum Pell Grant is only $5,550, so you are left with about $13,000 to cover out of your own pocket. And the federal minimum wage is $7.25 an hour, so that's about 34 hours a week, every single week of the year. KAMENETZ: If you're working to cover it. And, you know, that's pretty much full-time hours. And research shows that if you work more than 20 hours a week as a full-time student, it's really hard to graduate on time. BLOCK: Well, sticking with the four-year public institutions right now, what accounts for that steep rise in tuition there? KAMENETZ: Well, there's this perfect storm of effects. A big part of it is the decrease in public funding. So we can see a pretty much 1 to 1 correlation between recession years, for example. Education budgets get cut, and colleges pass on the rising cost to students. BLOCK: OK, so we've been talking about public universities, Anya. Now let's pivot to private universities, and by way of example, why don't we pick Stanford? If you look at the cost of a year at Stanford, how does it compare now with, say, 30 years ago? KAMENETZ: Well, in 1984-'85, in today's dollars, it cost $31,000 a year to go to Stanford. In 2014-2015 - again, this is cost in dollars - it costs $57,000 a year. So that's almost double the cost. BLOCK: Almost double. And what accounts for that? KAMENETZ: Well, the cost-drivers in the private sector are different from the public sector. They really feel the need to compete on prestige, and so they are engaged in these sort of perks wars - that these are spending on amenities, on the physical plant, on technology, on research labs. And there are increased personnel costs. That mostly comes on the administrative side. BLOCK: So the universities would say, you're getting more for your money now than you were 30 years ago. KAMENETZ: Well, you know, that's certainly a debate. And the fact is that the value of a college degree is higher than it's ever been. The question is, though, is college affordable for those who really need it? Is it serving as an engine of opportunity? BLOCK: You do wonder if as tuition has doubled, as you say - nearly doubled - what about professor salaries? Have they kept pace with the tuition costs? KAMENETZ: You know, professor salaries are really a bugaboo for college cost increases. But in point of fact, colleges have been able to hold the line on instructional costs, and they've done that by using adjuncts. You know, these are the part-time - the graduate students who teach about half of all classes now across higher education, and so, while there have been higher costs for benefits and for pensions at public institutions in particular, faculty salaries have been flat. And you really can't blame professor salaries for the rise in tuition. BLOCK: Could you make the claim that increased levels of student aid are bringing down the cost of tuition? KAMENETZ: Well, you know, there is a moderating effect of student aid, and colleges like to talk about this. But there's also concerns about how that money is given out. There's evidence that middle class and even upper-middle class students at state schools get more of the total financial aid dollars than the working-class students who really need it to go to school. BLOCK: You mentioned prestige earlier, Anya. How big a factor is that? In other words, that universities will charge what the market will bear, and there's some status in being the most expensive. KAMENETZ: Well, you know, the problem is that there isn't a lot of transparency in the higher education market. People don't really know what it is they're buying. And so price, by default, becomes a marker of quality. And this is exacerbated by the fact that the private universities - the most selective colleges are also the most expensive. And so it's very hard to look beyond that and really talk about what it means to have an affordable, quality education and hold the line on prices at the same time. BLOCK: That's Anya Kamenetz with our NPR Ed team. She's also author of the book "Generation Debt." Anya, thanks so much.